Rated R for blood, guts, and monstrous appetites. 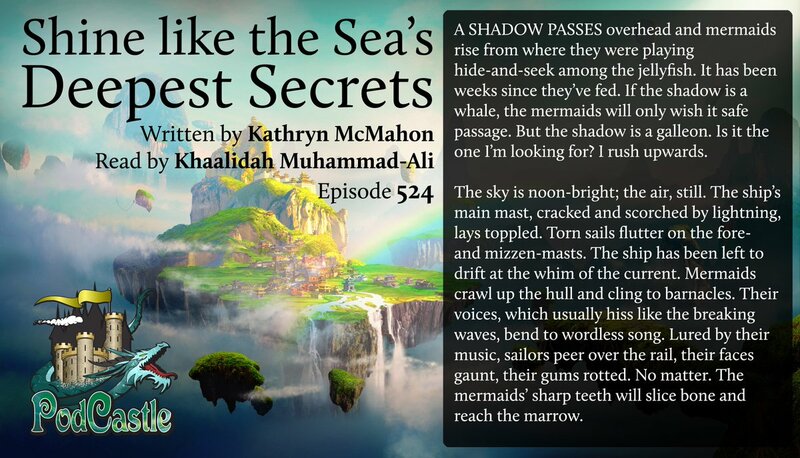 Originally published in Flame Tree’s gothic fantasy anthology Pirates & Ghosts: Short Stories. I'm surprised this story hasn't gotten more comments. I loved the language and the twist ending. Would love more from this author. Happy for more queer romances, even doomed ones. I loved the writing style, even though it was hard to follow aurally. Thanks again for including a text version for those of us who enjoy multiple mediums! I think the ghost was a very unreliable narrator. She didn't care anything about right or wrong, only her own feelings. As a pirate, I wouldn't be surprised if her Captain had done terrible things to earn her end. I liked the underwater creatures and interactions between them. Beautiful and mysterious. The mermaids could be thought of as dealers of mercy for the doomed sailors. Is dying under a spell that brings you ecstasy and a quick death really worse than dying from exposure and dehydration on the ruined ship?